KastKing copolymer fishing line is the ultimate link between you and the fish on your line. KastKing’s technologically advanced Copolymer Line was designed with this in mind. It is a scientific polymer blend that outperforms monofilament fishing line. KastKing Copolymer gives angler’s fishing tackle numerous advantages over monofilament fishing line, along with all the positive benefits of fluorocarbon fishing line at a fraction of the cost. It allows more solid hook sets than mono line for a significantly increased catch-ratio. KastKing Copolymer with a bit more stretch than fluorocarbon makes it the perfect line for fishing moving baits. If you’re using a mono fishing leader consider using KastKing clear copolymer line with lower visibility and extra toughness. 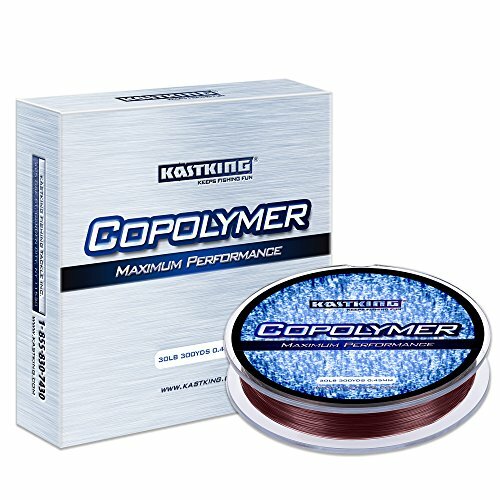 For fishing line monofilament isn’t your only choice or for mono leader try KastKing copolymer in 4lb, 6lb, 8lb, 10lb, 12lb, 15lb, 17lb, 20lb, 25lb or 30lb in your fishing line spooler. For fishing line braided is always the answer and brands such as spiderwire fishing line or power pro braided fishing line can be expensive. Whether you are using monofilament line, fluorocarbon fishing line, braid line or copolymer KastKing fishing line offers the best price!